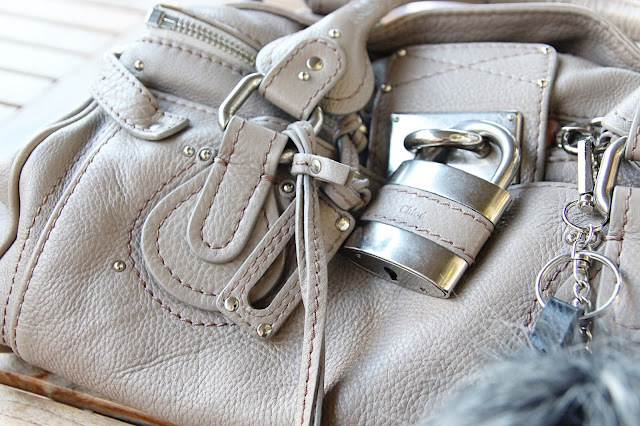 The Chloé Paddington is one of those purses that really splits opinions. Regardless of what others may say, I personally love this purse. From the hardware to the strap details and stitching, it really has a great mix of feminine details with a bold personality. When I'm going through my day-to-day life, I've been reaching for this purse constantly. It's got the room to fit all my essentials, and the soft supple leather feels great. While this purse can be quite heavy from all of the hardware, I personally don't mind since I drive everywhere in California. If you live somewhere walking intensive, you might want to keep it's weight in mind if you're interested in looking for a vintage Paddington. Anyways, let's talk about the miscellaneous things I lug around with me! Wallet | Kevin bought me this wallet when I started college, and I haven't stopped using it since. I've tried out other wallets since then, but I always go back to this guy. It's the perfect size to fit all of my bills and cards, plus it has a nifty long coin pocket inside. External Battery | I use the Poweradd Pilot 2GS to keep my phone alive. It charges my iPad and iPhone up in lightening speeds, and comes in a pretty gold color to boot. This little guy keeps my phone alive during those dire times while traveling (or if I choose to play Bejeweled a little too much). Ray-Ban Clubmaster | It's sunny in California, so I need to protect my eyes! They're in bad enough shape as it is! Notebook & Markers | I never really know when I'll get an idea or call that requires me to write things down. I also keep my schedule, and task list together in this one book. I personally love the gridded notebooks from Muji. 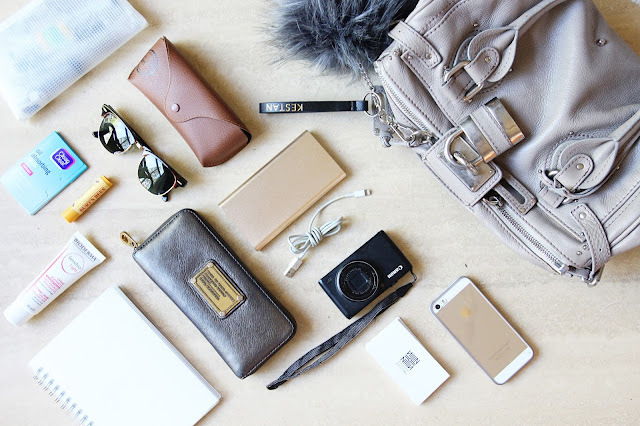 Camera | My Powershot is small, and keeping it in my bags makes it easy to snap photos or videos while out and about. Lotion, Blotting Sheets, and Lip Balm | It is dry, dry, dry here. Add in combination skin to the mix and things can get pretty miserable relatively fast. I only wear eyeliner during the day, and thanks goodness my Stila Stay All Day liner does not budge. That means I only need to care a few essentials on me. Business Cards | We like to use word of mouth to share Kestan with others. Keeping business cards on hand makes sure that it's quick and easy to share our website/business with others I might meet along the way. Key Ring | Speaking of Kestan, I have to mention our Pom Pom Keyring launching soon! 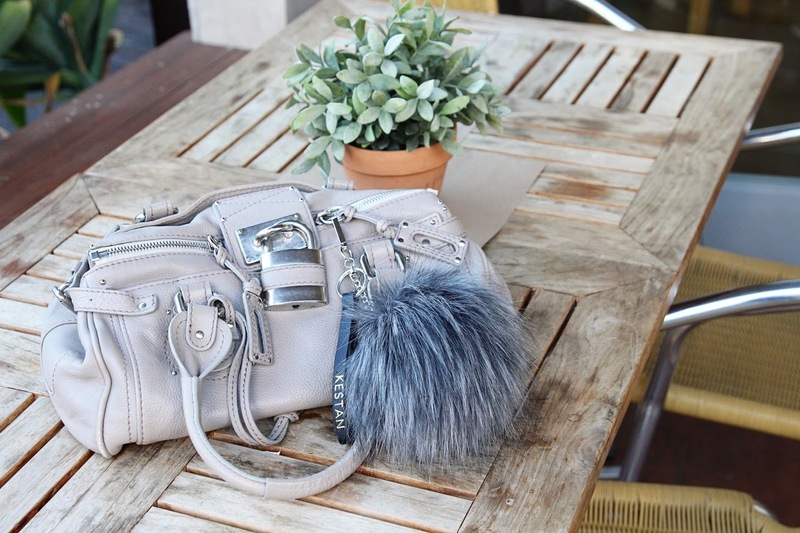 I love using it as an accessory to my bags to add a little bit of fun (the grey goes with just about everything). It's also great to keep your keys on if you're like my best friend who prefers keep the hand strap around her wrist while running errands. Plus, you'll never lose your keys again with this bad boy around!